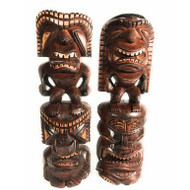 All of our Tikis are hand carved and the quality control is done in Kailua, Oahu ~ Hawaii! Hawaiian Tikis are spiritual figures who use their big, scary mouths and menacing expressions to frighten away evil. Their headdresses vary and have different meanings according to the shape. 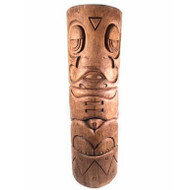 Tiki sculptures can be used inside or outside and become a great conversation piece. In the Hawaiian mythology there were 4 main gods: Ku, Kane, Lono and Kanaloa. 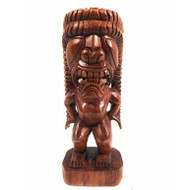 Our tikis are hand carved from either Albesia wood, palm or monkey pod wood. Our outdoor tikis are coated with Sikkens for maximum protection.